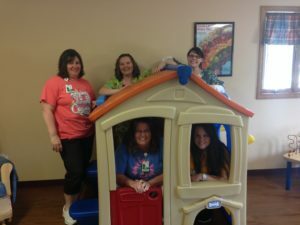 WIC | Macon County Health Dept. The Women, Infants, and Children Program, also known as the WIC Program, is federally funded program through the Department of Agriculture. The goal of WIC is to provide nutrition education, health assessments, and food vouchers for pregnant, breastfeeding, and post partum women and families with infants or children under 5 years of age. Participation in WIC is based on nutritional risk and income eligibility. Primary services provided by the Macon County Health Department include a health screening that includes dental, lead and hemoglobin screening; risk assessment; nutrition education and counseling; breastfeeding advocacy; and health care referrals. We have a Breast Pump Loan Program that brings a valuable resource to the community at no charge. For breastfeeding support, call or text our Breastfeeding Peer Counselor directly at 660-346-7275. Please call 660-395-4711 to schedule an appointment regarding WIC. Note to current Macon County Health Department WIC clients – if you are unable to keep your appointment, please be sure to call ahead to reschedule your appointment. Should you miss your appointment we are unable to guarantee that we can issue your WIC check on a walk-in basis. The health department does not provide WIC services on all business days so be sure to call ahead to reschedule your appointment so that you do not miss out on your benefits. Create an account and set up your profile – you will need your household ID number found on your folder. Choose a lesson from one of the five categories.